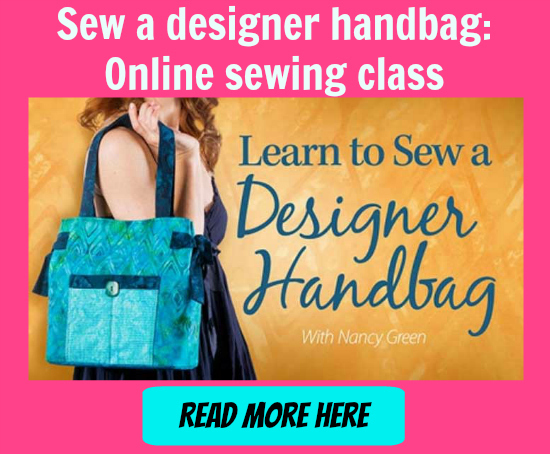 Have you ever taken part in a sewing series? A lot of quilters will be familiar with a Block of the Month Club where a new quilt block pattern is released each month until at the end of the year, you have all of your blocks to sew up the large finished quilt. There are a few Bag of the Month Clubs around and one we’ve been following is currently running at Creative Bug. If you’ve ever taken a video class on Craftsy, then you’ll be a little familiar with the concept of Creative Bug. Except here you don’t buy each class separately, you pay a fixed monthly fee for access to ALL of their classes. At just $4.95 per month or $50 for the whole year, we think it’s excellent value. There are presently more than 600 classes and new ones being released all the time.